Many years ago, before her Las Vegas stint, I went to a Bette Midler concert for the first time. Having been a fan of her comedy and true entertainer status it was a much anticipated trip. 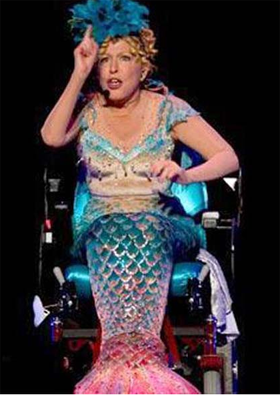 One sketch she did involved a kick chorus of glittered-out mermaids in electric wheel chairs. The content of the act was no less outrageous than the concept. I was riveted. The entertainment factor was undeniable, but what I kept coming back to was wanting to have been in THAT creative meeting where it was presented. It was so off the wall, so over the top, that it was destined to be a fan favorite, which it has become as it’s been part of her acts for decades. I wanted to know the process of how that got the go ahead. With the firestorm that has erupted over the US Olympic team uniforms being made in China it brings to mind an unspoken effect of the economic recession our country still functions under. This is not about the cost of manufacturing in the United States. There will always be places where outsourcing can be cheaper, initially, and as we’ve seen in the past with the uprising over human rights violations that those reduced operational costs bring ends up costing more in customer loyalty. That’s not new to the recession and that, even more than ever before, will work itself out. What it shows is the uncertainty that businesses instill in their individual employees. Once a company becomes comprised of individuals, rather than of representatives of the organization, it creates a culture where laying low and not standing up for what is right for fear of losing your job becomes the norm. And everyone suffers for that. Ralph Lauren is undoubtedly an American icon, representing the American Dream, rising from humble beginnings to a global business empire that reeks of American Patriotism. That is how the general public views them, how they advertise themselves, and how they essentially became the outfitters for the US Olympic Team. But they stumbled. Or, rather, they got caught stumbling. This isn’t the first time they’ve made uniforms in another country, but the timing of this, the CONTEXT of this, is ripe for becoming a public outcry. And Ralph Lauren is taking hits on the news, media, social media and even in Congress. A company of this caliber, of this visibility, of this position would be expected to have checks and balances in place, and I am sure that there were a number of individuals within the organization, both directly involved in this project and not, who recognized the irony of having these uniforms made in China. I’d be surprised if the issue wasn’t raised in meetings and discussions within the company. But in this day and age, pushing to do the right thing, at a higher cost, typically ends up with internal discord, lingering broken relationships and eventual “lay offs” for speaking up. Given that this economic situation has become the new normal, legions of business owners, bosses and employees have been “trained” to this culture and the value that empowered employees bring to progress and solutions is atrophying. Employees are in survival mode. I don’t know if it’s too late to get companies back to where they are a group of WE rather than a bunch of individual I’s. Part of the process, and hopefully the motivation, to change from this economic recession will be how to bring back the willingness to take risks, to bring back the comfort to speak up. Outsourcing production in China is a tried and true operational cost savings for businesses. It should have been considered an option. The public relations backlash associated with it, aside from it just being the wrong for uniforms that represent United States Patriotism, should have been immediately voiced and followed. Brin g the Glory back. Allow employees to have the guts to stand up. Your business will reap the benefits.